Bodybuilding is the use of progressive resistance exercise to control and develop one's musculature for aesthetic purposes. An individual who engages in this activity is referred to as a bodybuilder. In competitive bodybuilding, bodybuilders appear in lineups and perform specified poses (and later individual posing routines) for a panel of judges who rank the competitors based on criteria such as symmetry, muscularity, and conditioning. Bodybuilders prepare for competitions through the elimination of nonessential body fat, enhanced at the last stage by a combination of extracellular dehydration and carbohydrate loading, to achieve maximum muscular definition and vascularity, as well as tanning to accentuate the contrast of the skin under the spotlights. Bodybuilders may use anabolic steroids and other performance-enhancing drugs to build muscles. The winner of the annual IFBB Mr. Olympia contest is generally recognized as the world's top male professional bodybuilder. The winner of the Women's Physique portion of the competition is widely regarded as the world's top female professional bodybuilder. The title is currently held by Juliana Malacarne, who has won every year since 2014. Since 1950, the NABBA Universe Championships have been considered the top amateur bodybuilding contests, with notable winners such as Reg Park, Lee Priest, Steve Reeves, and Arnold Schwarzenegger. Winners generally go on to become professional athletes. Stone-lifting traditions were practiced in ancient Egypt, Greece and Tamilakam. Western weightlifting developed in Europe from 1880 to 1953, with strongmen displaying feats of strength for the public and challenging each other. The focus was not on their physique, and they often had large bellies and fatty limbs. This period also saw the rise of anabolic steroids in bodybuilding and many other sports. In bodybuilding lore, this is partly attributed to the rise of "mass monsters", beginning with Arnold Schwarzenegger, Sergio Oliva, and Lou Ferrigno in the late 1960s and early 1970s, and continuing through the 1980s with Lee Haney, the 1990s with Dorian Yates, Ronnie Coleman, and Markus Rühl, and up to the present day. 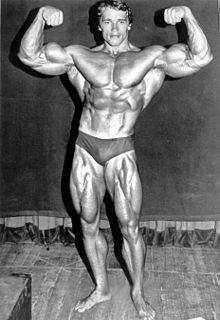 Bodybuilders such as Greg Kovacs attained mass and size never seen previously but were not successful at the pro level. Others were renowned for their spectacular development of a particular body part, like Tom Platz or Paul Demayo for their leg muscles. At the time of shooting Pumping Iron, Schwarzenegger (while never admitting to steroid use until long after his retirement) said that "you have to do anything you can to get the advantage in competition". He would later say that he does not regret using anything. In 2003, Joe Weider sold Weider Publications to AMI, which owns the National Enquirer. The position of president of the IFBB was filled by Rafael Santonja following the death of Ben Weider in October 2008. In 2004, contest promoter Wayne DeMilia broke ranks with the IFBB and AMI took over the promotion of the Mr. Olympia contest. In the early 21st century, patterns of consumption and recreation similar to those of the United States became more widespread in Europe and especially in Eastern Europe following the collapse of the Soviet Union. This resulted in the emergence of whole new populations of bodybuilders from former Eastern Bloc states. Other notable natural bodybuilding organizations include the National Physique Committee (NPC) and the North American Natural Bodybuilding Federation (NANBF). NPC competitions screen competitors using ineffective lie detector tests to ensure fair practices. Such tests are very error-prone, and some competitors are not even tested. E. Wilma Conner competed in the 2011 NPC Armbrust Pro Gym Warrior Classic Championships in Loveland, Colorado, at the age of 75 years and 349 days. In competitive bodybuilding, bodybuilders aspire to develop and maintain an aesthetically pleasing body and balanced physique. In prejudging, competitors do a series of mandatory poses: the front lat spread, rear lat spread, front double biceps, back double biceps, side chest, side triceps, Most Muscular (men only), abdominals and thighs. Each competitor also performs a personal choreographed routine to display their physique. A posedown is usually held at the end of a posing round, while judges are finishing their scoring. Bodybuilders usually spend a lot of time practising their posing in front of mirrors or under the guidance of their coach. The cutting phase entails remaining in a net negative energy balance (calorie deficit). The main goal of cutting is to oxidize fat while preserving as much muscle as possible. The larger the calorie deficit, the faster one will lose weight. However, a large calorie deficit will also create the risk of losing muscle tissue. "Dirty bulking" is the process of eating at a massive caloric surplus, without trying to figure out the exact amount of ingested macronutrients (carbs, fats, and proteins). Weightlifters who are attempting to gain mass quickly with no aesthetic concerns often choose to use the "dirty bulk" method. Strength training through weights or elastic/hydraulic resistance. Specialized nutrition, incorporating extra protein and supplements when necessary. Adequate rest, including sleep and recuperation between workouts. Bodybuilders often shorten these three steps into the well-known motto "eat clean, train hard, sleep well". 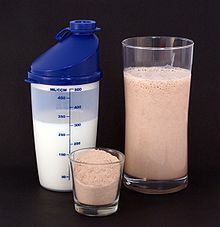 Protein milkshakes, made from protein powder (center) and milk (left), are a common bodybuilding supplement. Bodybuilders often split their food intake into 5 to 7 meals of equal nutritional content and eat at regular intervals (e.g. every 2 to 3 hours). This approach serves two purposes: to limit overindulging in the cutting phase, and to allow for the consumption of large volumes of food during the bulking phase. Eating more frequently does not increase basal metabolic rate when compared to 3 meals a day. While food does have a metabolic cost to digest, absorb, and store, called the thermic effect of food, it depends on the quantity and type of food, not how the food is spread across the meals of the day. Well-controlled studies using whole-body calorimetry and doubly labeled water have demonstrated that there is no metabolic advantage to eating more frequently. A recent trend in bodybuilding is to inject synthol into muscles to create larger bulges, or injecting PMMA into muscles to shape them. Use of PMMA to shape muscles is prohibited in the United States. An article by Muscle & Fitness magazine, "Overtrain for Big Gains", claimed that overtraining for a brief period can be beneficial. Overtraining can be used advantageously, as when a bodybuilder is purposely overtrained for a brief period of time to super compensate during a regeneration phase. These are known as "shock micro-cycles" and were a key training technique used by Soviet athletes. Sesame oil is often used in such mixtures, which can cause allergic reactions such as vasculitis. As the injected muscle is not actually well-developed, it might droop under gravity. Notable examples are Greg Valentino and Moustafa Ismail. ^ Emery, Michael. "Men's Bodybuilding: A Short History". Bodybuildingreviews.net. Retrieved February 25, 2014. ^ Karthikeyan, D. (January 12, 2013). "Locked horns and a flurry of feathers". The Hindu – via www.thehindu.com. ^ Schwarzenegger, A. (1999). The New Encyclopedia of Modern Bodybuilding. Fireside, NY: Simon & Schuster. ISBN 978-0684857213. ^ Rhodes, Jesse (July 19, 2009). "Bodybuilders Through the Ages". ^ "Al Treloar at SandowPlus.com". Sandowplus.co.uk. December 28, 1903. Archived from the original on June 29, 2012. Retrieved October 5, 2012. ^ "IFBB Professional League - Jim Manion, Chairman IFBB Professional League". Ifbbpro.com. September 26, 2007. Archived from the original on September 21, 2012. Retrieved October 5, 2012. ^ "Arnold: No Regrets About Steroids". CBS. February 11, 2009. Retrieved August 13, 2013. ^ Theunissen, Steve. "Arnold & Steroids: Truth Revealed". Archived from the original on October 8, 2003. Retrieved February 27, 2007. ^ Controlled Drugs and Substances Act, SC 1996, c. 19, Schedule IV, no. 23. ^ Littman, Jean (November 13, 2007). "Bodybuilding And The Olympics: An Ongoing Controversy". article99.com. Archived from the original on December 5, 2007. ^ Ifbb Faq – Ifbb. Ifbb.com (February 22, 1999). Retrieved on 2016-11-29. ^ Barnett, Mitchell (Nov 2010). "Women and Anabolic Steroids: An Analysis of a Dozen Users". Clinical Journal of Sport Medicine. 20 (6): 475–81. doi:10.1097/JSM.0b013e3181fb5370. PMID 21079445. ^ Glenday, Craig (2013). Guinness World Records 2014. The Jim Pattison Group. p. 60. ISBN 978-1-908843-15-9. ^ "Top 10 Most Impressive Bodybuilder Physiques of All Time". Muscleprodigy. Retrieved June 14, 2013. ^ "Judging the 2008 Mr. Olympia: Judges Provide Full Transparency and Complete Explanation of Results". Muscletime. Retrieved June 14, 2013. ^ Lambert, Charles; Frank L; Evens W (March 2004). "Macronutrient considerations for the sport of bodybuilding". Sports Med. 34 (5): 317–27. doi:10.2165/00007256-200434050-00004. PMID 15107010. ^ Giblin, Chris. "Clean Bulking: for Frustrated Hard-Gainers, Clean Bulking Is Attainable If You Focus Your Diet Accordingly with the Right Foods and Strategy." Joe Weider's Muscle & Fitness, vol. 75, no. 8, 2014, p. 89. ^ Evans, Rian. (April 6, 2015) Dirty Bulking: Why You Need To Know The Dirty Truth!. Bodybuilding.com. Retrieved on 2016-11-29. ^ MacDougall JD, Elder GC, Sale DG, Moroz JR, Sutton JR (1980). "Effects of strength training and immobilization on human muscle fibres". European Journal of Applied Physiology and Occupational Physiology. 43 (1): 25–34. doi:10.1007/BF00421352. PMID 7371625. ^ "Weight Training Intensity or Volume for Bigger Muscles?". Retrieved February 24, 2012. ^ "Major Nutrients in Food". webMd. Retrieved August 27, 2013. ^ Manoreem, MM; Thompson J; Russo M (March 1993). "Diet and exercise strategies of a world-class bodybuilder". Int J Sport Nutr. 3 (1): 76–86. doi:10.1123/ijsn.3.1.76. PMID 8499940. ^ Skinner, Rob (March 2002). "Coach & Athletic Director". 71 (8): 3. ^ Dimitriadis, George; Mitrou, Panayota; Lambadiari, Vaia; Maratou, Eirini; Raptis, Sotirios A. (August 2011). "Insulin effects in muscle and adipose tissue". Diabetes Research and Clinical Practice. 93 Suppl 1: S52–59. doi:10.1016/S0168-8227(11)70014-6. ISSN 1872-8227. PMID 21864752. ^ Miranda, Lisa; Horman, Sandrine; De Potter, Isabelle; Hue, Louis; Jensen, Jørgen; Rider, Mark H. (2007). "Effects of contraction and insulin on protein synthesis, AMP-activated protein kinase and phosphorylation state of translation factors in rat skeletal muscle". Pflügers Archiv. 455 (6): 1129–40. doi:10.1007/s00424-007-0368-2. PMID 17957382. ^ King, Michael W. "Substrates for Gluconeogenesis". IU School of Medicine. ^ Lambert CP, Frank LL, Evans WJ (2004). "Macronutrient considerations for the sport of bodybuilding". Sports Med. 34 (5): 317–27. doi:10.2165/00007256-200434050-00004. PMID 15107010. ^ Manchester, K. L. (2012). "Sites of Hormonal Regulation of Protein Metabolism". In Munro, H. N. Mammalian Protein Metabolism, Volume 4. pp. 229–98. ISBN 978-0-323-14257-1. ^ Bellisle F, McDevitt R, Prentice AM (1997). "Meal frequency and energy balance". Br. J. Nutr. 77 Suppl 1: S57–70. doi:10.1079/BJN19970104. PMID 9155494. ^ Taylor MA, Garrow JS (2001). "Compared with nibbling, neither gorging nor a morning fast affect short-term energy balance in obese patients in a chamber calorimeter". Int. J. Obes. Relat. Metab. Disord. 25 (4): 519–28. doi:10.1038/sj.ijo.0801572. PMID 11319656. ^ Smeets AJ, Westerterp-Plantenga MS (June 2008). "Acute effects on metabolism and appetite profile of one meal difference in the lower range of meal frequency". Br. J. Nutr. 99 (6): 1316–21. doi:10.1017/S0007114507877646. PMID 18053311. ^ Philen RM, Ortiz DI, Auerbach SB, Falk H (1992). "Survey of advertising for nutritional supplements in health and bodybuilding magazines". JAMA. 268 (8): 1008–11. doi:10.1001/jama.268.8.1008. PMID 1501305. ^ Schroeder E, Vallejo A, Zheng L, et al. (2005). "Six-week improvements in muscle mass and strength during androgen therapy in older men". J Gerontol A Biol Sci Med Sci. 60 (12): 1586–92. doi:10.1093/gerona/60.12.1586. PMID 16424293. ^ Grunfeld C, Kotler D, Dobs A, Glesby M, Bhasin S (2006). "Oxandrolone in the treatment of HIV-associated weight loss in men: a randomized, double-blind, placebo-controlled study". J Acquir Immune Defic Syndr. 41 (3): 304–14. doi:10.1097/01.qai.0000197546.56131.40. PMID 16540931. ^ Giorgi A, Weatherby R, Murphy P (1999). "Muscular strength, body composition and health responses to the use of testosterone enanthate: a double blind study". Journal of Science and Medicine in Sport / Sports Medicine Australia. 2 (4): 341–55. doi:10.1016/S1440-2440(99)80007-3. PMID 10710012. ^ Alexopoulou O, Abs R, Maiter D (2010). "Treatment of adult growth hormone deficiency: who, why and how? A review". Acta Clinica Belgica. 65 (1): 13–22. doi:10.1179/acb.2010.002. PMID 20373593. ^ Ahmad AM, Hopkins MT, Thomas J, Ibrahim H, Fraser WD, Vora JP (June 2001). "Body composition and quality of life in adults with growth hormone deficiency; effects of low-dose growth hormone replacement". Clinical Endocrinology. 54 (6): 709–17. doi:10.1046/j.1365-2265.2001.01275.x. PMID 11422104. ^ Savine R, Sönksen P (2000). "Growth hormone – hormone replacement for the somatopause?". Hormone Research. 53 (Suppl 3): 37–41. doi:10.1159/000023531. PMID 10971102. ^ Pupka, Artur; Sikora, Julita; Mauricz, Jakub; Cios, Dariusz; Płonek, Tomasz (2009). "Stosowanie Syntholu w kulturystyce" [The usage of the Synthol in the body building]. Polimery W Medycynie (in Polish). 39 (1): 63–5. PMID 19580174. ^ http://internationalsurgery.com/pmma-injections-and-bodybuilding/ Retrieved June 22, 2017. ^ Shusterman, Richard (2012). Thinking Through the Body: Essays in Somaesthetics. Cambridge University. p. 43. ISBN 978-1107019065. ^ Mosley, Philip E. (2009-05-01). "Bigorexia: bodybuilding and muscle dysmorphia". European Eating Disorders Review. 17 (3): 191–198. doi:10.1002/erv.897. ISSN 1099-0968. PMID 18759381. ^ Smith DJ (2003). "A framework for understanding the training process leading to elite performance". Sports Medicine. 33 (15): 1103–26. doi:10.2165/00007256-200333150-00003. PMID 14719980. ^ a b c Pupka, A; Sikora J; Mauricz J; Cios D; Płonek T. (2009). "The usage of synthol in the body building". Polim Med. (in Polish). 39 (1): 63–5. PMID 19580174. ^ Childs, Dan (May 16, 2007). "Like Implants for the Arms: Synthol Lures Bodybuilders: Risky Injections Mean Massive Muscles for Users". ABC News. Retrieved March 4, 2011. ^ a b Foggo, Daniel (May 13, 2007). "Bodybuilders puff up with 'Popeye the Sailorman' oil jab". Sunday Times. Archived from the original on May 24, 2011. Retrieved March 4, 2011. ^ Henriksen, TF; Løvenwald JB; Matzen SH (2010). "Paraffin oil injection in bodybuilders calls for preventive action". Ugeskrift for Lægerer (in Danish). 172 (3): 219–20. PMID 20089216. ^ a b Iversen, Line; Asja Lemcke; Mikael Bitsch; Tonny Karlsmark (2008). "Compression Bandage as Treatment for Ulcers Induced by Intramuscular Self-injection of Paraffin Oil". Acta Derm Venereol. 89 (2): 196–7. doi:10.2340/00015555-0583 (inactive 2019-02-16). PMID 19326015. ^ Schaefer, N (2011). "Muscle enhancement using intramuscular injections of oil in bodybuilding: review on epidemiology, complications, clinical evaluation and treatment". European Surgery. 44 (2): 109–115. doi:10.1007/s10353-011-0033-z. ^ Darsow, Ulf; Harald Bruckbauer; Wolf-Ingo Worret; Heidelore Hofmann; Johannes Ring (2000). "Subcutaneous oleomas induced by self-injection of sesame seed oil for muscle augmentation". Journal of the American Academy of Dermatology. 42 (2): 292–294. doi:10.1016/S0190-9622(00)90144-0. PMID 10642691. ^ Schäfer, C.N. ; H. Guldager; H. L. Jørgensen (2011). "Multi-Organ Dysfunction in Bodybuilding Possibly Caused by Prolonged Hypercalcemia due to Multi-Substance Abuse: Case Report and Review of Literature". Int J Sports Med. 32 (1): 60–65. doi:10.1055/s-0030-1267200. PMID 21072745. ^ Grenoble, Ryan (2015-05-05). "Guy Who Wanted To Be A Real-Life Hulk Almost Had To Have Arms Amputated". Huffington Post. Retrieved 2017-12-01. ^ Koopman, M; C. Richter; R. J. M. Parren; M. Janssen (2005). "Bodybuilding, sesame oil and vasculitis". Rheumatology. 44 (9): 1135. doi:10.1093/rheumatology/keh712. PMID 16113147. For a list of words relating to used in bodybuilding, see the Bodybuilding category of words in Wiktionary, the free dictionary. Wikimedia Commons has media related to Bodybuilding.